Gorne, a town mentioned in the Poison Song book series is a serene, if sleepy Indoril community on the island of Gorne, east of the mainland and south of Necrom. Despite its small size, Gorne is notable for being the Sandil clanstead and retirement home, a prominent family in House politics. Ranalith Sandil, retired councilor is the highest Sandil noble living in the town and oversees the farmers and merchants. Interestingly, Gorne island is virtually free of animals, adding to the serene atmosphere. It is revealed in dialogue that they have recently been hunted to extinction by Silyn Avel. Gorne can only be reached by ship or with a brisk swim. Regular passenger travel occurs between Gorne and Enamor Dayn. Directly north of town is the Sandil Ancestral Tomb, fitting for a retirement home. A bit further north is the cave of Vissamu, which houses a wrecked ancestral holding of the pre-Tribunal House Dagoth. 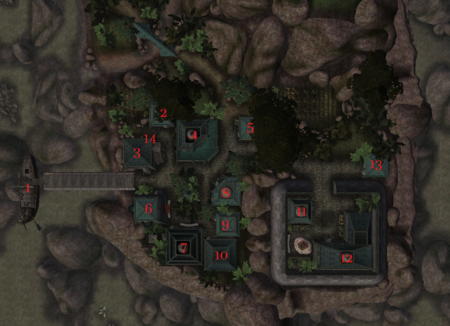 The Thoroughly Looted Shipwreck is located on the ocean floor northeast of Sandil Manor. Northwest of Gorne, also on the ocean floor is the entrance to Gormoro Grotto. This page was last modified on 27 February 2019, at 06:59.